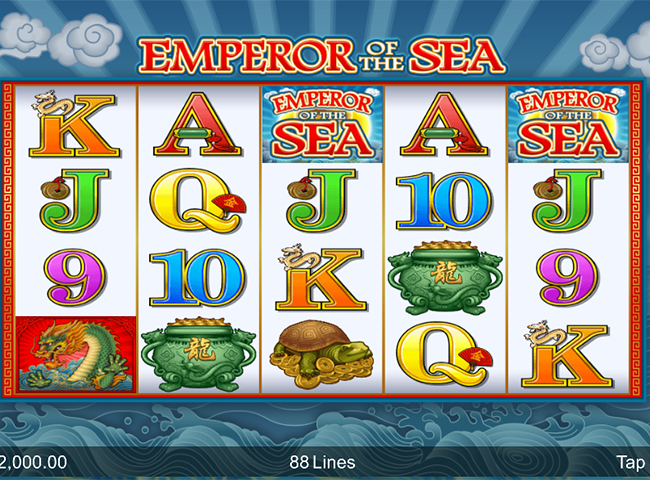 The Emperor of the Sea slot game by Microgaming is a 2017 release with a mythical Asian theme. The game has an alternative set up where the player can select how many paylines they wish to bet on with each spin. The choice is 36 lines, 68 lines or 88 lines. This video slot has a medium volatility and The Emperor of the Sea RTP (Return to Player) is 96.5%. Graphically, like many of the Microgaming slots, this one is not particularly sophisticated. Nonetheless, the game is entertaining enough and with Free Spins, and stacked Wilds that can fill up to 15 positions on the reels and drive massive wins, this is definitely one to look into further. The maximum payout – a non-progressive jackpot – is 1,000 coins. You can play a few spins for free before spending any cash on real play mode, and the game is available on mobile, desktop and tablet. Play now at one of our recommended microgaming casinos, Betsafe Casino, or read on full a full review, including a look at each feature and a profile of the game. Asian-themed slots are rich pickings for design studios, and here Microgaming have delved into the myths of the East again to produce Emperor of the Sea Slot. The backdrop to the reels is swirling seas and puffy clouds, and the symbols are all taken from far Eastern imagery. So, as well as the usual card signs of 10 through Ace you get ships, pots of coins, globes, Koi carps, Tortoises, and the top symbol of all, the Dragon Emperor himself. The Wild symbol is the game logo. The scatter is a Golden Ignot, and this triggers your Free Spins round – more on that in a moment. So, we’re dealing with a medium variance or volatility game here, meaning it won’t payout with every spin, but nor will you have to wait an age to see some winning lines. A 96.5% RTP is fairly normal too. Bear all this in mind when choosing your stake which can be anywhere from 38p to £44 per line. Just use the up and down arrows on the bet level to set your stake. And of course, when playing this Microgaming slot you will want to first decide how many lines you are betting on – 36, 68 or 88. The cost per spin goes up the more lines you choose, but we recommend betting on 88 for the maximum win opportunities. Free Spins: These are triggered by three of more of the scatter symbols which are the Golden Ignot. You get 8 Free Spins in this bonus round, and they come with the additional excitement of Rolling Reels and Growing Wilds. The Rolling Reels feature is simple – when you hit a winning line combination, the symbols in that line are replaced with new ones on the next free spin, giving you more chances of winning. The Growing Wilds feature means that your Wild stacks will start to grow with each spin – and stacks can grow until up to 15 positons are filled, bringing a huge pay off. Whilst not being massively sophisticated in terms of themes and design, Emperor of the Sea is nevertheless a very enjoyable slot, thanks largely to the stacked Wilds which can bring on some big wins at all points in the game. Of course, it’s the Free Spins round where most of the action happens, and Growing Wilds are an exciting opportunity to hit a good payday.